Everyone on this site should know by now that I’m a huge Boss fan and that in my 250 or so strong pedal collection, Boss currently contributes the largest number or 16. There are always a few Boss pedals I have on my rolling wishlist, and while I only have 4 semi-permanent Boss fixtures in my pedal-chain right now - the Keeley Freak Fuzz modded Blues Driver, Alchemy Audio modded GE-7 and NS-2, and of course the Boss MD-500 - I frequently rotate in other Bosses into other slots of the chain. Last year saw the surprise introduction of the Waza Craft Metal Zone, along with the more widely expected Waza Dimension C - both of which I have on the wishlist and am expecting to add by year end. If you scan Reverb.com you can always tell which pedals are in the most demand by how high some crazy individuals are prepared to list them at. And while nowhere near the levels of the Klon Centaur, the Slow Gear SG-1 has been clocking up some lofty figures of late. 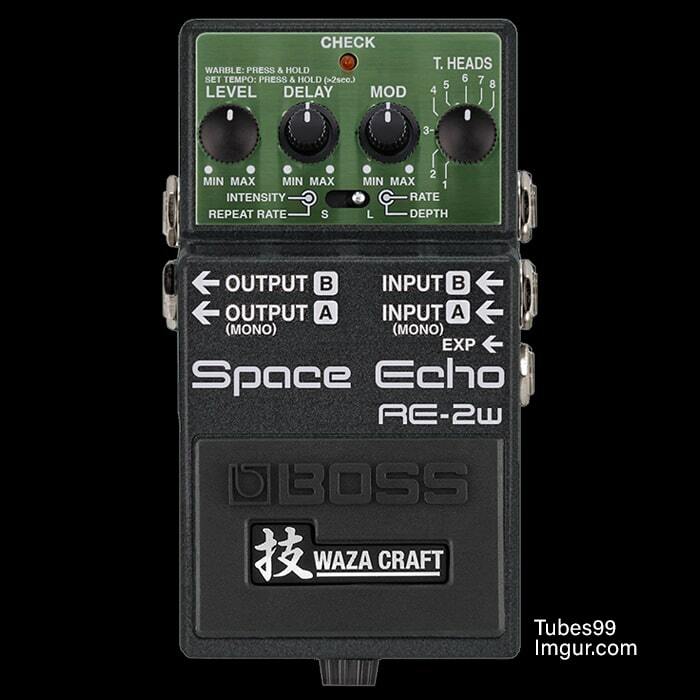 You do of course have numerous clones and alternatives here like the BYOC Lazy Sprocket, Guyatone SV2, Mooer Slow Engine Mini, TC Electronic Crescendo, and VFE Bumble Bee - but we fans really want a proper hot-rodded Boss Version with some added Waza extras! As the core component of the Swedish Death Metal sound, the HM-2 has always been in steady demand to such a degree that pristine examples are almost unicorn rare and fetching equally fantastical prices. I’ve done a lot of features on HM-2 style pedals / clones, and recommend the Angry Swede Mini from Decibelics, the compact HMD-1 from XIX Tech and the Left Hand Wrath from Lone Wolf Audio if you have more space to spare. Regardless of the many fantastic alternatives available there is still a clammer for the reissue of the original - and when the new Metal Zone Waza Craft appeared many metal-heads would have preferred to see the HM-2 in a similar enclosure - with the additional mid-range controls - which is what has informed and influenced my mock-up above. Finally, and the most recent of the 3 - the Hyper Fuzz has also been getting a lot of love of late, and has seen the price for pristine versions also creep up - not quite to Slow Gear levels yet! But there is a definite latent demand for Hyper Fuzz types out there with alternatives and clones coming from the Abominable Electronics Demon Lung, Behringer SF300 Super Fuzz and kinda sorta the Smallsound/Bigsound Buzz Fuzz. As per the Slow Gear and Heavy Metal - fans would still prefer to get their hands on official Boss merchandise - and it remains a decent proposition as far as I’m aware. I currently have a pretty pristine version of the Hyper Fuzz in the collection, but would not hesitate to supplement with any of the above if, as and when they become available. An interesting trivia point here is that all of the above pedals occurred in sequential production runs which numerically covered a full span from 1979 to 1997, but did not overlap - per the visual above. A very simple volume auto-swell pedal with just two dials - Sensitivity and Attack - which pretty much control how quickly and when the swell triggers - as excellently demo'd in Pepe Music's above video. As I said in the intro, there are various alternatives and clones already available - the BYOC Lazy Sprocket, Guyatone SV2, Mooer Slow Engine Mini, TC Electronic Crescendo, and VFE Bumble Bee - yet I still feel that there would be significant demand if Boss Waza-fied their original and re-released it. I adapted and retouched my mockup from another similar I found online - deciding that as per some of the clones I had seen - that a Level parameter might be a decent addition here. I feel Boss could really go to town on this one if they wanted with more Compressor-like control parameters covering attack, sustain and release of the swell. There are a variety of secondary effects you could apply here too. I mostly kept this one simple though - so it's sort of line with the more basic ones of the Waza line. I would definitely spring for one such or similar if it ever were to materialise. As with many slightly later Boss pedals there is a significant price difference between Made in Japan vs Made in Taiwan editions - with the former always fetching significantly more - often twice the price of the latter. I have spent much of the last few months researching and trying out a variety of different Heavy Metal HM-2 alternatives and clones, and although not necessarily my absolute favourite metal voice, I can still appreciate the appeal - and understand why there is such a significant demand. Of course there is a whole subgenre of Metal with 100's of bands still active in the Death Metal movement which started with Entombed back in Stockholm around 1987 - or 4 years into the life of the HM-2. You can read my piece on HM-2 Alternatives for further insights and I do make some recommendations at the end. Like most though I was kind of rather expecting a HM-2 Waza when the MT-2w arrived sort of in its place. Much of the commentary then - which I kind of agree with was that the HM-2 fans would love to see a Waza Craft HM-2 with the added parametric mids from the Metal Zone. Lots of players like to further juice the HM-2 with a boost - TS or otherwise, so this could be the beefed up 'C' Custom voicing on the HM-2w. I'm sure the boffins at Boss are crunching the numbers and figuring out just which of these three pedals is likely to be met with the most actual demand. I would surely spring for one of each, but I would guess that the HM-2 had the most ready-made market as seems pretty evident. I was chasing a pristine version of this for a good few months over 2017/2018 - before I found the right one at the right price on Ebay actually. There were a number on offer on Reverb.com in not as good condition but for significantly more - so it always pays to shop-around. In any case, this is a somewhat beefed up 3-mode version of the Shin-Ei Super Fuzz - a much loved Japanese classic octave fuzz which took the Octavia approach to a somewhat more strident plane. This Fuzz is well known for its ability to cut through the mix - which is why you see it on quite a number of pro pedalboards. You typically find these on Reverb.com well in excess of £200 these days, while I acquired mine for a little over half of that. There are a tonne of really great Super Fuzz circuit clones out there, but many players are still drawn to Boss's specific iteration of that - and there is a smattering of some very finely crafter boutique clones of this circuit out there. I still feel there is room for a Waza version and a slightly different beefier voicing for the Custom mode. This is probably another more specialist choice, although I do feel there is a ready-made market for this pedal too. Of course it's impossible to second-guess what Boss are plotting to release this year, but one has to believe they keep one eye on what's happening on Reverb.com. Which is why I think they launched the DC-2w last year - as pristine versions of those were really going for silly prices for a while. The MT-2w release while a surprise, wasn't really unprecedented though - the original is after all Boss's second biggest selling pedal of all time after the DS-1 and has shifted around one million units to date. The new pedal seems to have had a really positive impact and was pretty much universally well received and highly commended. Of the three above - I have an inkling that the HM-2 is the frontrunner here - I just think there's a fully established ready-made market for that. The second most bankable pedal is likely the Hyper Fuzz - while the Slow Gear is definitely a slightly left-field choice - with appeal mostly for ambient style players. I personally would spring for each of these as mentioned, but am almost 100% sure that not all of these will see the light of day. I eagerly await the results of the Boss number-cruncher jury to see what they've decided on. Boss has a tendency to surprise, and we may still get some sly dark stalking horse that most of us weren't aware of. Next: Why the Strymon Volante is my favourite type of Delay Pedal, and how it could be improved! Where to Next for Boss's Compact Format Pedals?